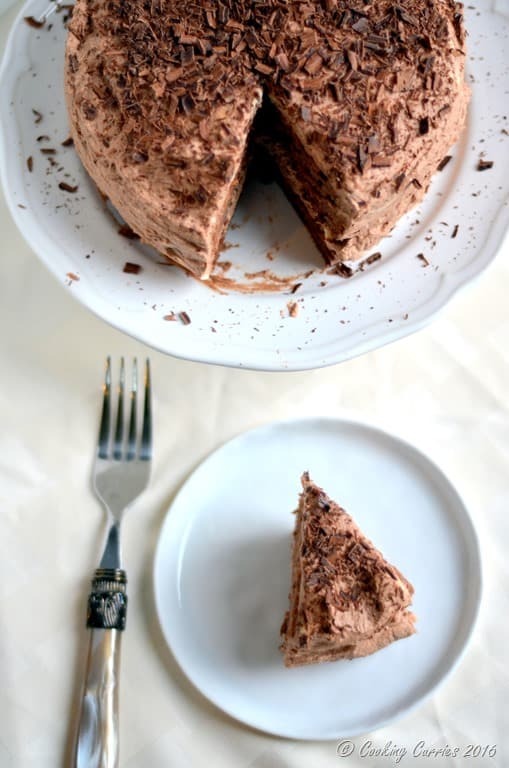 Chocolate and Coffee – the unbeatable combination comes together in this Espresso Chocolate Cake, where every bite is delightful! It is the husbands birthday today! The person occasionally referred to as AJ or the meat-a-holic. His name used to pop up more often before lil V began taking up more “word real estate” on here. He is the one behind making sure that this blog runs without very much hiccups. He is my go-to tech guy. He is also the dude who has to figure out how to help out with the blog without getting on the wrong side of this control freak. (That’s not very easy, you know!) I should not forget to say that all the meat recipes in here are courtesy of him, for making this vegetarian want to learn and cook delicious meat fares, so he can eat it and also so I can get it on the blog here! Here’s to the dude who is as much a part of this blog as I am, but mostly ends up staying behind the scenes! This birthday cake post is for you! Happy Birthday! I made this Espresso Chocolate cake earlier this year, again to celebrate something fantastic for the husband at his work. It just never got around to being on the blog. 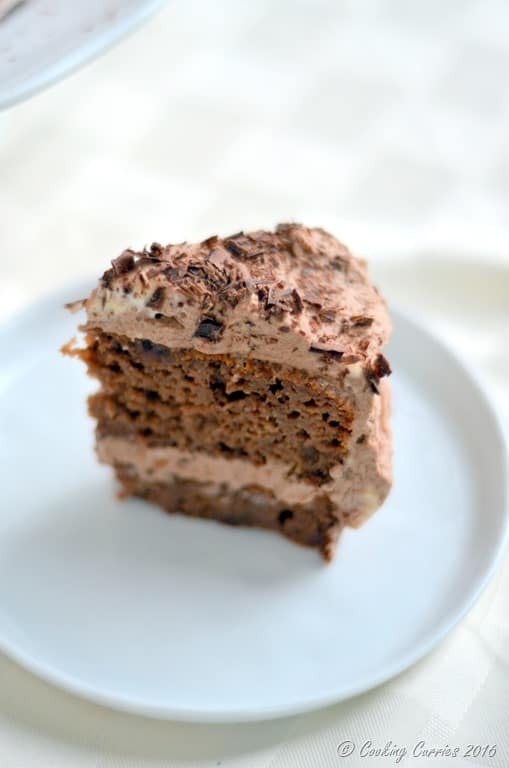 Even though it is more of a denser cake than the moist fluffy cake that everyone loves, the brownie like texture works really well for the chocolate-coffee combo and we really enjoyed it! I wanted him to take some back to work the next day, but we couldn’t resist ourselves to leave enough for the next day! Without further ado, here is the recipe! Grease two 6-inch round cake pans with cooking spray. Cut out parchment paper to the diameter of the pans and place them inside the pans. Spray on top of the parchment paper as well. Add the flour, cocoa powder, sugar, salt and baking powder to the bowl of a stand mixer and mix a little on low speed until just combined. Now add the butter, applesauce, yogurt, vanilla extract, egg, espresso and the melted chocolate to it and beat on medium speed until well combined. Pour this, divided evenly, into both the prepared cake pans. Bake in the oven for 20-25 mins or until a cake tester / toothpick when inserted comes out clean. Take out and let it cool in the pans over a wire rack. Now for the icing, clean out the stand mixer bowl and wipe to dry. Add the cream and mascarpone and whisk till they combine. 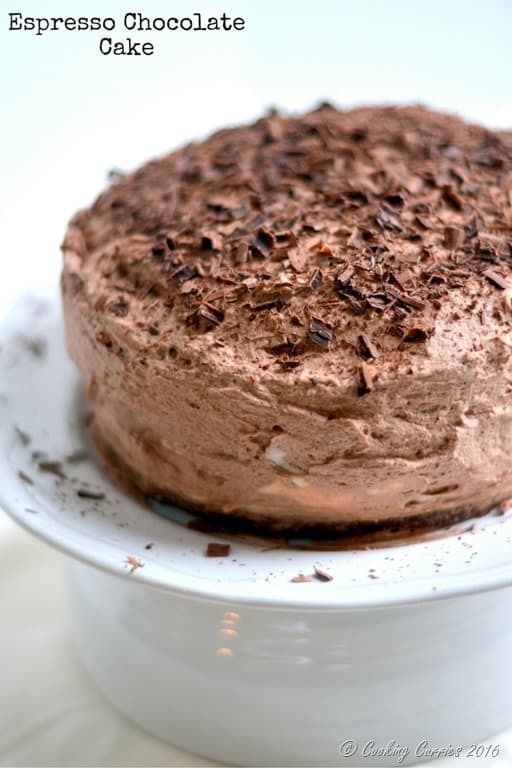 Add the cocoa powder, powdered sugar and the vanilla and coffee extracts and whisk till it forms stiff peaks. Place one of the cooled cakes on a cake stand. Apply the icing on top of it with a spatula and even out. Place the other cake on top of it and apply the rest of the icing on top of the cake and all around it. Smoothen it out as much as you can. 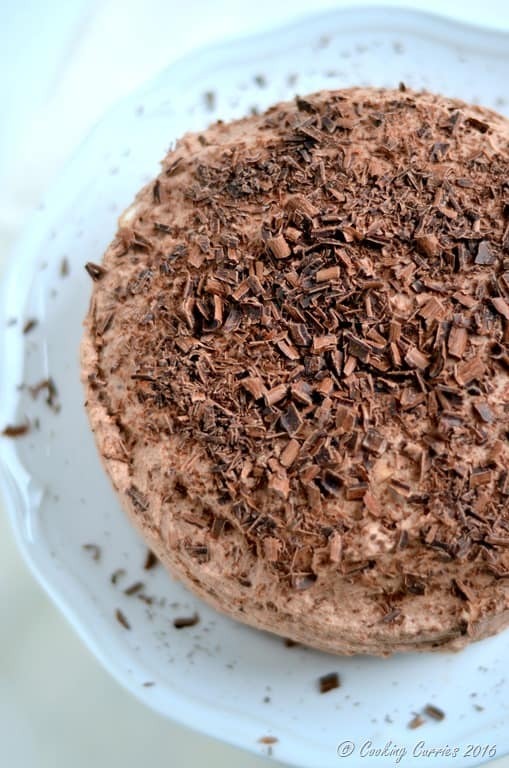 Shave some chocolate all over the cake, cut and serve! Now add the butter, yogurt, vanilla extract, egg, espresso and the melted chocolate to it and beat on medium speed until well combined. This looks so amazing. I am not sure I could eat just one piece! Ha! The Control!!! Lol!!! You are not alone! ? This cake has my name all over it! I love how you have the chocolate bits even on top of the frosting! Pinning! Happy 2-months belated birthday to your husband! This looks so addictive! I might need more than one slice of this delicious cake! Yum! You are very welcome, I hope you love it! 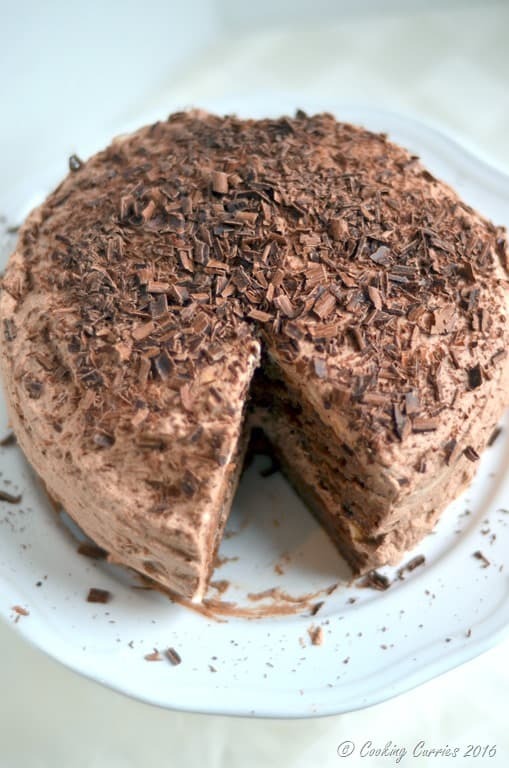 Keep in mind that it is a much denser cake, not your regular moist and soft chocolate cake! My husband loves it though! ? Bookmarking this to make again, thanks @cookingcurries! Aww, thanks a lot Elle!! I will share this on my FaceBook page! ? Awesome, thanks again, and thanks for replying so quickly when I was wondering about the recipe. You rock!